Kizhi Oil, is most beneficial in musculoskeletal disorders (pain, swelling and stiffness), and neuro–vasculopathy (numbness, loss of sensation, burning sensation, cramps). Kizhi Oil, is recommended for arthritis and rheumatism and highly beneficial in low back ache (muscular & disc), neck pain (spondylosis), muscle pain (Fibromyalgia), joint pain and problem related to nerves and blood vessels. Sussuria lappa, Zingiber officinale, Acorus calamus, Moringa oliefera, Allium sativum, Capparis spinosa, Cedrus deodara, Brassica campestries, Alpinia galangal, Anethum sowa, Gossypium herbaceum, Sida cordifolia, Phaseolus mungo, Dolichos biflorus, Piper longum, Piper chaba, Boerrhavia diffusa, Hemidesmus indicus, Shorea robusta, Rubia cordifolia, Glycyrrhiza glabra, Bee wax, Withania somnifera, Lacifer laca, Cinnamomum camphora, Sesamum indicum, Tamarindus indicus, Dhanyamlam, Strychnos nuxvomica, Piper beetle, Euphorbia neriifolia, Calotropis gigantium. 1. Apply Kizhi Oil on the body over the needy area. 2. 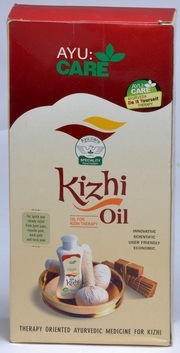 Take Kizhi Oil; pour into a vessel and heat. 3. Dip the Kizhi powder bolus in hot Kizhi Oil and gently rub over the painful area. Repeat the procedure till the oil in the vessel is finished. Continue the process for 15-30 minutes once in a day for 3 days, which will give relief for the pain. Explore more Institute of Indian Therapies products.